Headquartered in Houston, Texas, ConocoPhillips is one of the largest energy corporations in the world. The company was created through the merger of Phillips Petroleum with Conoco Inc. in 2002. For over 125 years, Conoco had been providing high-quality petroleum products and superior customer service. These days, the company's gas stations are known under three names, including Conoco, Phillips 66, and 76. If you want to get rewarded every time you fuel up your car at Conoco Phillips gas stations, you may consider applying for gas rewards credit cards that give generous rebates on your gas purchases. Want to save money at the gas pump? Apply online for a gasoline rewards card, and start accumulating generous cash back rebates each time you fuel up your vehicle. Promo APR on balance transfers and purchases. 1% cash back rewards on all purchases. Free online access to your Experian credit score. Annual fee between $0 and $99. Balance Transfer Fee 4% of each balance transfer; $5 minimum. Round up to the nearest 10 points. No promo rate on balance transfers. ** The calculation is based on average gas prices (which is $2.486 for regular gas as of January 2018). Savings may vary. This calculation is for informational purposes only. 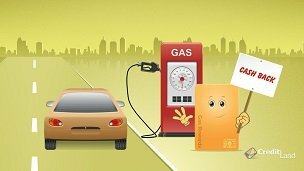 Gas rewards cards are extremely popular among gas consumers. If you have a car, you're sure to know how high gas prices can affect a family budget. Want to stay immune to fluctuating gas prices? A gas rebate credit deal can be a good choice for you! Credit cards with gas rebates work in a similar way to regular cash back cards. Every time you use your card to purchase gas or other eligible items, you earn valuable cash back rebates that can be redeemed for checks or gift certificates. For your convenience, some issuers automatically apply gas rebates to your account each month. The best thing about gas rewards deals is that they give great cash back rebates on gas purchases that regularly make anyway. Furthermore, the best gas rewards cards allow their holders to get good rebates on some other everyday purchases, including groceries and fast food. This way, you can make the most of your gas card's rewards by using it to make your everyday purchases. By paying your balance in full each month, you will minimize interest rate costs, and be more likely to benefit from your gas rewards bank deal. Before submitting your online application, be sure to read its terms and conditions carefully to understand how your new rewards card will work for you. I'm moving to different area where will be a lot of Conoco gas stations, so my question is where can I apply for Conoco credit card?